A lot of reviewers enjoy playing in the 2018 version of the Kobe AD. Some players think that these Nike basketball shoes are supportive. Many wearers say that the cushioning system is really responsive. Many are happy with how these Nike basketball shoes look; they think that they can definitely rock the Kobe AD off the court. A good number of wearers complain that the traction needs a long time to break in. At least one reviewer says that this Kobe Bryant shoe does not deserve its high price. A handful of players think that the materials need a little improvement. Just like the Nike KD 11 and the PG3, The 2018 version of the Nike Kobe AD is definitely a shoe that many sneakerheads are excited about. What we know is that the Kobe AD 2018 needs some time to break in, especially its traction. But because the comfort and support that the Kobe AD gives are at least decent, these Nike basketball shoes still delivers on the court. I don't think that they're worth the $140 price tag. These have got you with that quick explosiveness and I really enjoyed playing in them. It’s only been a week but I really enjoyed these right out of the box even if it doesn’t have the latest and greatest tech specs (ie Flyknit with React). It just does everything well but I do do wish that the medial arch had some support..even still it isn’t a deal breaker. I personally would have liked a flatter outsole in the heel but hey it’s not my sig shoe. The Nike Kobe AD returns in 2018 still with a low-profile silhouette. It features a traction pattern that resembles and feels like the one on the Kobe 10. For cushioning, it has Zoom at the heel. This unit ensures a stable and responsive ride. Cushion. The cushioning setup of the Nike Kobe AD 2018 is composed of phylon and a large Zoom Air unit at the heel. This cushioning setup is similar to some Kyrie models. The phylon that it uses is the injected type, which is said to be lighter and a lot more airy than the compression molded one. This phylon-and-Zoom setup in the Kobe AD delivers comfort and responsiveness, especially to those who use their heels often. Traction. The outsole material and the traction pattern on it are pretty much similar to the ones on the Kobe 10. This setup offers multidirectional grip on both indoor and outdoor courts, though exclusive indoor use is much more recommended. Length and Width. To be safe, new buyers are advised to go with their usual Nike sizes if they wish to cop the Kobe AD 2018. Some reviewers warn that the shoe may need some time to adjust to the contours of the foot. Lockdown. Three support elements are incorporated in the design of these Kobe Bryant basketball shoes. First, the outsole is made flat to provide stability without ever needing a shank. Second, the heel has both internal and external counters. The internal one is thinner than the other. Finally, the midsole is soft enough to roll up during motion so that it acts like an outrigger that keeps the foot supported. The shoe is made entirely of mesh. This breathable material is topped on some parts with a synthetic suede-like overlay, giving the shoe its streamlined appearance. The lightweight mesh at the forefoot is purposefully left exposed to ensure breathability. Like many Kobe shoes, the Kobe AD of 2018 is a low-profile offering from Nike. As such, it can easily be worn off the court. The shoe has a large Swoosh in full display on the rear lateral side. The medial side has a zoomed in Sheath logo. The left heel area also has the Sheath while the right has the word ‘KOBE’ on it. The pull tab on the tongue also prominently displays the Sheath. 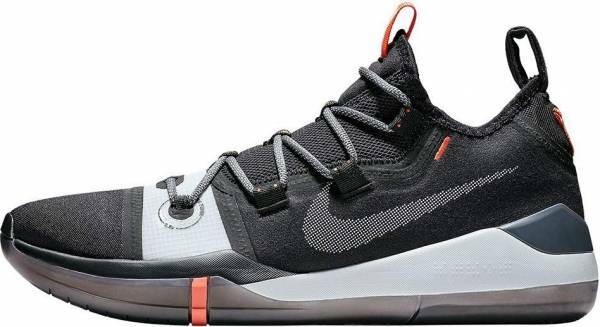 The Kobe AD 2018 debuted in a colorway that Nike dubbed ‘The Legacy Continues.’ This rendition is said to be the company’s tribute to athletes like Kobe Bryant who puts winning over anything else when they are on the court. This version has an upper that features a combination of gray and blue. Its laces are bright orange and the outsole and lace loops are yellow.